Another reason to hate snow. You wind up, more times than none, talking to wood. As some of you already know, I’ve been changing my work flow up quite a bit. Over the last few weeks, I’ve been experimenting with going 100% digital. What that means is, instead of drawing with pencil on Bristol, then inking with traditional black pen, I now do everything in Photoshop. One of my latest acquisitions that makes this much easier is this contraption called a Wacom Cintiq. 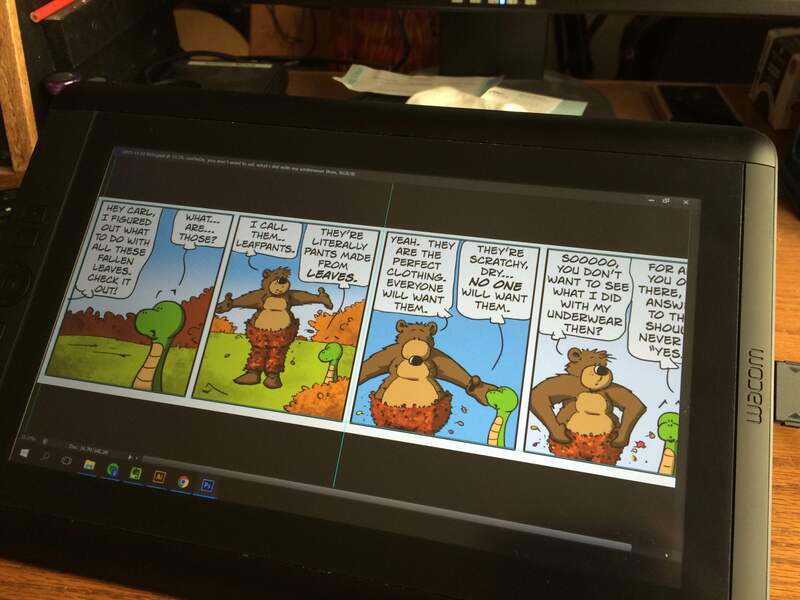 It is a graphic pen tablet that allows me to draw directly onto a screen instead of a digitizer pad. This method mimics the traditional pencil/pen on paper and it allows me to be more comfortable drawing directly in Photoshop, it’s quicker coloring my strips, and I no longer have to burden myself making up boards to draw on. A fellow cartoonist pal Mike Witmer of Pinkerton Comics turned me onto this method and I took the plunge. I can honestly say, I very happy with the results. I think this will be my new style for the foreseeable future. Welcome to the twenty-first century Flatt Bear. I definitely has changed my style. I think the draw on the display is a great idea. Then I Googled Wacom Cintiq. Good Grief!!! I nearly passed out when I saw the price. I could buy another 2nd hand motorcycle for that. As great as they are I think I’ll be going with the regular ones if I decide to get one. Yeah. They aren’t cheap. i got the smaller 13″ one. I got a smoking deal on it on eBay. Real good. There are other companies that make budget monitors like Huion and Monoprice, but I was a little leery after reading some of the reviews. You can also go the direction of the Surface Pro 3. They getting cheap as well. Duffy is stumped once again! Love this one, P.J.! Also, enjoy the behind-the-scenes pic. Your work looks better than ever!! Thanks so much Mark! Means alot!! I LOVE the way your work is looking with the Wacom Cintiq! I have a digital tablet, but I’m still not brave enough to make the switch from bristol. Baby steps I suppose. Keep up the great job! Wishing? PSH! Intimidation or extortion works far better. We’ll let the “Mafia” handle that.